The Avengers are one of the most well known superhero teams in comics. They had a film that broke the box office a few years back and they have now had 3 shows to date. Earth’s Mightiest Heroes was the best of the three and it is one that ranks very high up in the comic ranks. I definitely say that it is Marvel’s top show and it isn’t likely going to be surpassed anytime soon. 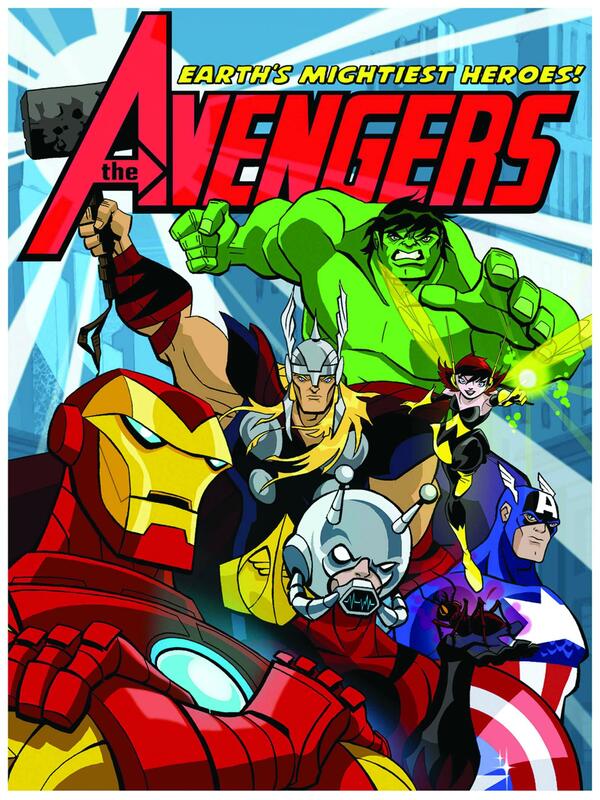 Season 1’s main plot is about the Avengers forming so that they can bring back a large group of super villains who escaped from Shield prisons all across the planet. It’s technically the plot of the show, but it’s mostly used as a backdrop. The season is pretty episodic, but it does begin a lot of plotlines that are explored in those episodes so it’s definitely better than the average pre arc. Ultron, Kang, and Loki all get multiparters as well as the Leader. There may not be much of an overreaching story arc, but most of the episodes have a cliffhanger scene at the very end so the transition from episode to episode is actually pretty great. Season 1 is a lot of fun and you can count on many excellent battles. Season 2 decided to go for a big plot and one that featured the Skrulls deciding to invade the planet. They have taken many people in powerful positions so they are all set for their bid to conquer the human race. The Avengers have to get past several obstacles and the lack of trust in their teammates to even have a shot at taking down the Skrulls. 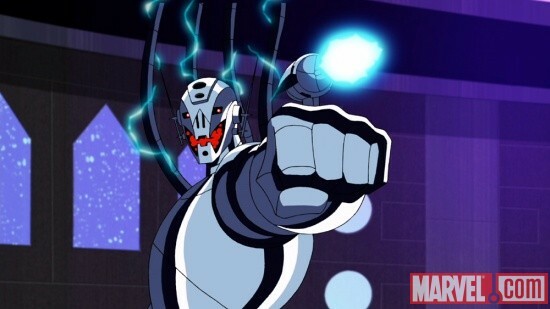 Other highlights of the series includes the return of Ultron and Kang. It should be noted that the Kree also get a multi parter as they finally make their big move. This season can get a little dicey since we have to miss out on Hulk, Captain America, and Thor for various parts of the season, which makes for a limited roster. The Guardians of the Galaxy do get to appear though, which is pretty intense. I will admit that I was one of the many Marvel fans who was not a huge fan of the designs for the show when they first popped up. The characters just looked a little off. Thor was actually one of the biggest offenders for me. His build just didn’t seem right and his arms were huge. The hammer looked so small when Thor was holding it and the handle should have been longer. That being said, you get used to it as you watch the show. I wasn’t a huge fan of Captain America’s design compared to United They Stand, but it is still a very good design in its own right. The Abomination was one of the characters who drew the short straw in terms of design. I don’t know whether this is a result of the character designs or whether it was the overall animation, but the fight scenes were pretty over the top in a great way. Some of the energy blasts looked like they came out of an anime. The action scenes definitely shine in this series and they put most of the other Marvel shows to shame. 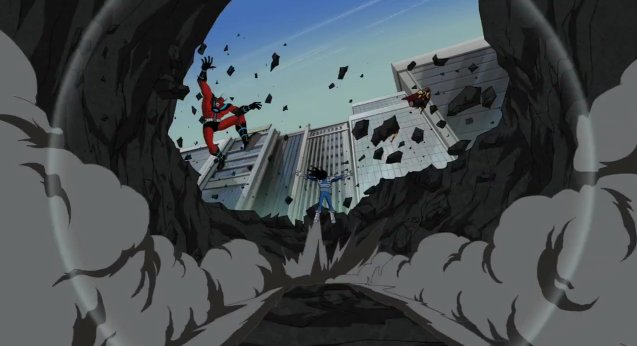 The first few episodes tried some unique things with the animation, particularly Iron Man’s view from inside the suit. I think that the animation took a bit if a dip after the beginning, but it still looked pretty good overall. Season 2 certainly looks sharp and it was definitely an improvement. I wasn’t sure about this at first, but I definitely am now. How does it stack up against the Justice League? I am afraid that it is not even remotely close. Justice League wins in all areas, but it should be noted that the show’s roster was comprised of heroes who were far cooler than the Avengers. The Avengers are cool of course, but they are no Justice League. Considering that the Justice League show also happens to be my favorite non anime tv show of all time, this isn’t bad for Avengers. It’s safe to say that no western Marvel show will ever be able to top Earth’s Mightiest Heroes. Now, let’s look at the show’s portrayal of the characters. Iron Man is one of the main characters and he is a pretty good hero. He acts just like what you would expect from him. He is always ready with a witty comeback and his armors are fairly powerful. The show essentially takes all of Stark’s good qualities without bringing in his bad ones. He does a pretty good job of being team leader until he decides to give up the role. His fans should be pretty pleased with this incarnation of him. His battles against Kang and Dr Doom are matches that we have longed for and we finally get to see them play out here. Captain America is our courageous leader once more. The writers really seem to like him so Cap gets quite a few wins under his belt. Even the mighty Terrax and the Super Skrull are powerless against him. Unfortunately, he misses the first few episodes of the series and a big chunk of them in the second half. This is sad for his fans of course, but he still gets a lot of screen time and he tends to look very good. It is basically a spot on incarnation of the legendary hero. Thor looks better than he has ever looked in this series. He is portrayed as an intelligent warrior while still keeping his incredible strength and skill. He isn’t crazy about technology, but he is never obnoxious about it. His banter with Tony Stark on the subject can be pretty fun to watch. As with Superman in various DC shows, Thor does lose to an opponent who is weaker than him at times. Luckily this only happens a reasonably few times and he typically looks as strong as he should. He looks like the Thor of the 60’s and that’s a good thing. Bruce Banner is pretty much a non factor here because the Hulk is in control for the whole series. Bruce only gets a cameo once in a while. As for the Hulk, his portrayal is pretty good here. He is decently smart and a very loyal friend to have. He gets a raw deal in season 2 since he is tricked by the Skrulls and forced to miss a lot of it. He looks pretty strong and he is portrayed as the strongest Avenger in physical strength. He is definitely a likable character. The Wasp is a lot more cheerful than usual and it works for her character. She isn’t the strongest Avenger, but she can fight when necessary. This is easily the best portrayal of her that I have seen and it will be tough to too this version. Wasp never backs down from a fight and she even takes on the Vision. Even if her chances of victory are slim. Wasp will jump into battle anyway and it is why she is one of the better Avengers. Antman had a big role in the original Avengers show, but then he began to fade into obscurity. The new Marvel film aims to change that..more for the superhero than for Pym. Pym actually doesn’t end up looking quite as good in EMH. It is to be expected since he isn’t the fearless leader anymore, but he is still an Avenger. He wants to rehabilitate the villains and he puts a lot of effort into this goal. Unfortunately, most of the villains don’t plan on changing sides anytime soon. He starts to think that the Avengers have lost sight of this and coupled with the Ultron incident causes him to leave the team. This causes his character to undergo a radical change as he becomes more of a hot head who tends to act overconfident. While I typically like this kind of character a lot, it comes off as a little forced and it is also hard to take him seriously. Antman was a good character in the show, but he was definitely outshined by the others. Hawkeye had a tough road since it would be nearly impossible to pass his original animated version. That being said, he’s typically a likable character. It can be sad to see him get tricked and one upped by Black Widow for most of season 1, but he does manage to capture her on occasion. His skill with a bow is as excellent as ever and Hawkeye is always brimming with confidence. He couldn’t pass the original version, but this is still the Hawkeye that I remember. Black Widow is also pretty true to form as no side can really tell if she is working for them or if she has an ulterior motive. Her accent is at its strongest here and she rarely gets to operate with the Avengers since she’s a solo act from start to finish. She’s a pretty good agent, but Hawkeye is actually able to best her when they fight. Black Widow’s never been my favorite character, but she still looked decent here. Black Panther joins the team pretty early on in the series, but he was never my favorite character. He’s a little too confident and he has no problem hacking into the Avengers mansion when he feels like it. He’s the definition of a “hype” character who constantly insults everyone and belittles them. He may only be human, but he always gets his hits in and he puts his kingdom before the Avengers. A noble gesture I’m sure, but he’s really just a copy of Captain America, but without the leader’s character development. Ms. Marvel arrives in season 2 and she cannot be trusted as much as the other members since she also works for the government. She was quick to turn on the heroes when the government duties created a conflict. She is just trying to help her country of course, but the whole scene didn’t look very good. Ms. Marvel is a capable heroine who can still fight at the Hulk’s level so that’s pretty good and she is a solid character despite having her flaws. She does get a lot more screen time than the Vision, who is basically thrown in at the last minute. The Vision looks pretty good and very tough when he first appears. He gradually gets weaker, but it never goes too far as he still helps out a lot in the final battles. I didn’t really care for Vision’s big moment where he betrayed the Avengers, but he’s a good hero to have. I just wish that he had turned good in a different scene. Graviton is the first major villain in the show and it’s why the series started out on a high note. His abilities are very impressive and it’s no stretch to say that he is the strongest villain in the entire series. There are many other powerful opponents who do make this very debatable. He’s a very likable villain and this show made me a fan of him. Seeing him take on the combined might of Thor, Hulk, and the other Avengers is incredible and it’s not something that I shall forget anytime soon. It’s too bad that he never got to appear again, but maybe next time. Ultron is the villain that everyone was hyped for and he did not disappoint. He got a pretty great two parter when he first appeared and then his return was also pretty great. Naturally, his demise in both appearances is loaded with plot hax, but that’s just because the show did a good job of adapting his character. He looked about as strong as he should and he was thoroughly annihilating the Avengers. He has definitely been a great villain in all incarnations and I believe that Age of Ultron should be able to keep up this tradition. Kang The Conqueror is probably my third favorite villain in the show so I definitely wanted to put him next to Ultron and Graviton. He may seem like a much weaker villain on the surface, but his tech definitely brings him up to their level. His array of barriers and energy attacks make him a very tough opponent to deal with and you can even say that it is impossible to beat him. He only loses when he lets his guard down and forgets to block or fight back. It’s the fate of being an overwhelmingly powerful villain in the midst of heroes who are strong, but not strong enough to legitimately defeat him. Red Skull is certainly not as impressive as the first few villains and it’s surprising that it took so many episodes for him to finally appear in the present. He’s fairly generic and he’s definitely not a threat no matter how many inventions he gets a hold of. He does give us one of the better episodes in the series when he assembles his own crew, but it still doesn’t make him a good villain. He wants revenge on Captain America and that sums up his character arc. Skull’s team consists of quite a few members. Dr. Sampson is one of them and he was not my favorite supporting character anyway. I did appreciate the fact that he didn’t blame the Hulk for what went down at the Cube and he actually dealt with his new powers pretty well. That being said, he’s just not a interesting character. The Falcon’s one shot role is probably disappointing for his fans. He actually had potential to be a good character and he was much better than the Falcon in Avengers Assemble. His appearance was just too short to really get a good grasp of how he was. One of the final two members was the Winter Soldier. After Bucky vanished when Captain America fell into the ice, he was forced to work for Skull for decades. It’s easily the saddest sub plot in the series and he really didn’t have a choice since he was on his own and they effectively brainwashed him. He tries to atone for this once he gains his freedom back and this is probably the best incarnation of Bucky that we’ve seen so far. He’s pretty noble and you can tell that he is trying to be a better person. Finally, we have Red Hulk. He gets a few appearances although his role is still not very large. He does get to fight Thor and the Hulk, which shows how powerful he is. I like him as an enemy although he’s not very interesting. Watching him sucker the Avengers into allowing him to join is pretty wince worthy, but a plot twist at the end definitely helps to negate those scenes. 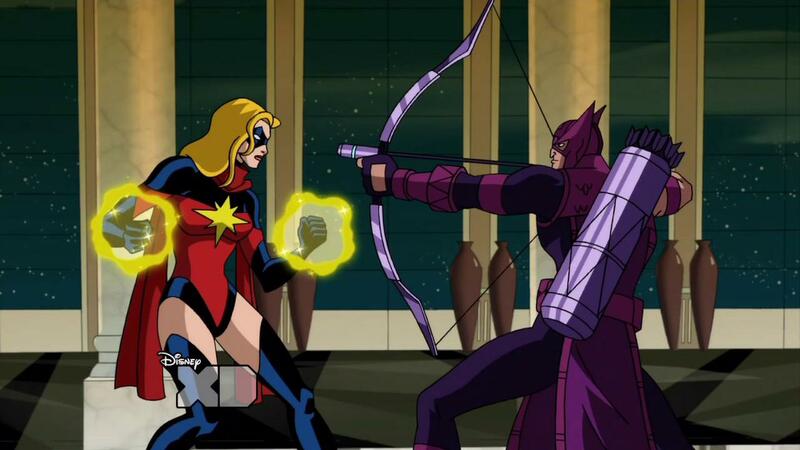 The New Avengers are introduced to the scene in Kang’s big return. The villain managed to destroy the Avengers so an automated protocol quickly gathered up the new heroes. One of them was Luke Cage. He seems to know what he’s doing and his street manner of dealing with his obstacles is a nice change of pace from the politically correct superheroes who help him against the villains. He doesn’t get much of a role and he doubts himself pretty quickly, but Cage still has what it takes to be an Avenger. He’s a step up over Iron Fist, who is still cool, but really has no character development. He appears for a very short period of time and he’s pretty ineffective against Kang. His hand to hand skills are great and they would do well against most opponents, but it was simply a bad mach up against someone like Kang. We also got to see War Machine and I was not impressed. His weapons still look terrible compared to Iron Man’s and he was way too serious when the other heroes were just trying to have a good time. He arguably has more experience in the art of being a super hero than the first two fighters so he needs to lead by example. Spider Man was also selected for the team and he also got an episode to himself before that so he’s all set on the character development area. He was adapted pretty faithfully as he tells a lot of jokes, but never manages to get hit. He’s the only member of the team who was able to dodge every single one of Kang’s attacks. His spider sense is his weapon and he just uses his jokes to keep the enemy off guard. This is the Spiderman that fans will remember from the good ole days and it’s good to see him getting the respect that he deserves. I was more than satisfied with his portrayal here. Wolverine also gets to join the team and he’s definitely in character. Unfortunately, this means that he gets animal violence in his scene as he destroys a few dinosaurs. It’s the worst scene in the entire show and you can bet that it hurts his character. It’s hard to root for him after such a scene and he also doesn’t really help a lot when the team is fighting Kang. That just makes it worse since he wasn’t needed in the episode and the heroes still would have gotten the job done. The Fantastic Four are recurring characters in the background of the show. The Thing gets more of a role than the others since he does join the New Avengers, but he doesn’t look particularly impressive when it comes down to strength. He’s pretty likable and you’ll be satisfied with his portrayal even if he looks like a second rate fighter. Reed Richards looks pretty great as he belittles everyone and puts up a brave front when Galactus appears. Human Torch and Sue Storm don’t get to do a whole lot, but they look pretty decent when they get to appear. Nick Fury changes a lot as the show goes on. He fights on the front lines more in season 1 and then he turns into the MCU version of Fury in season 2. He’s pretty corrupt as you would expect from a Shield agent, but he has his moments where he can actually be likable. He was a capable leader for Shield (Not going to bother using the periods everywhere) while he was around. Maria Hill steps in for him once the Skrull invasion occurs. She is notably less tolerant with heroes than Fury was and she can definitely be a thorn in the side of the heroes. Hill does mean well and she is definitely a likable Shield agent, but her policy towards the heroes can definitely hold her back. The Guardians of the Galaxy get to appear and this was before their film so the roster is much different. It’s vastly superior to the normal crowd as we have someone with Green Lantern’s abilities. Groot, Star Lord, and Rocket Raccoon are still around. I’m still not the biggest Rocket fan, but it is always good to see him jump into the action. Groot is simply Groot and still the worst member on the team. Star Lord was pretty reasonable and it was a very fun episode as we saw them match up against the Avengers before fighting Korvac. The Guardians are lucky that Thor was not there since the episode had the potential to be a stomp for the Avengers. Their portrayals all seemed pretty good. Baron Zemo is another big Cap villain and he gets to team up with the Masters of Evil for a while. He never gets any super powers, but the Norn Stone makes him more of a threat in his final appearance. He’s still not my kind of villain though and he mostly just lives on by backstabbing all of the other villains. The series could do without him. The Enchantress looks much more formidable than you would expect and she goes toe to toe with the Hulk and Thor in the series. Her magical abilities seem to be very well suited for offense and her speed is impressive. As a character, I’m still not a fan of hers as she always lets romance cloud her better judgment. Getting defeated by Zemo at the end is pretty bad for her and her loss in round 1 was bad as well. She lets her guard down a little too easily considering how powerful she is. Just wiping out her enemies would save her a lot of grief. The Leader gets a multi part episode towards the beginning of the series, but then he vanishes. This is definitely one of his better portrayals, but he’s still not a great villain. His lack of attack power is just hard to get around. It’s actually why I am not a big fan of the Abomination in this show. He’s constantly portrayed as being much weaker than the Hulk and it undermines the notion that he could actually be a rival to the green Avenger. He never looks good, not even once as the series goes on and this very well could be the worst portrayal of him. Wonder Man looks a lot different from his counterpart in the first Avenger show. He is always in his energy form and the villains basically have a hold of his life so it’s tough for him to go back to the Avengers. He has his hero moment and he ends on a high note, but he should have kept an open mind about Stark before. (Not that Tony was pretty polite when they met) He may have had a better fate. Dr Doom gets a brief role in the Skrull arc, but it’s a critical one that really helps the heroes out. He is a political enemy so he still wants the Earth to be in one piece. His armor looks impressive as it can keep up with Tony’s and likewise with his intellect. It was definitely a good portrayal of the villain. He certainly looks better than Loki. Loki’s big two part episode to end season 1 wasn’t very interesting and I can’t say that I cared for any of his appearances. He is a difficult opponent to handle because of his trickery. His design is pretty unique and I’m not sure what the writers were going for, but I suppose that it works. Galactus finally joins the fray in the final episode and it’s good to see him. He doesn’t actually have a mind this time, which does undermine him as a villain, but he is still pretty strong. It may be his worst portrayal to date, but he’s a decent villain. I just wish that he could have fought back against the heroes instead of just staying there and taking everything that they had to give. His heralds are also pretty souless and weak as small groups of Avengers are able to take them down with ease. It’s the price of filling an episode with so many villains and fights. Power levels have to go out of the window and there can be no form of character development. Ronan appears for the Kree and he looks pretty good against the Avengers. Thor may not have been there, but he was still keeping the Hulk and Iron Man at bay for a while until Ms. Marvel finally took him down. He looked much better than he did in the FF cartoon. He’s certainly not one of my favorite villains, but he makes for a nice opponent for the heroes. The other notable Kree agent would be Captain Marvell and I really didn’t like that guy. He never knew when to pick a side and he only jumped in at the end once the battle with the Supreme Intelligence was over. His abilities seem pretty interesting, but he’s just not a good character. Naturally, there are many more villains to be found in the show. We got a healthy amount of them and the only big one that the show missed was probably Count Nefaria. Some of the villains that I didn’t mention include: Purple Man, Whirlwind, The Absorbing Man, the FF villain who looks like an insect, but with a name that’s hard to spell, Bi Beast, and many more. The series is definitely a complete one and it’s one of the few shows with 50+ episodes that I’ve seen in its entirety more than once. For some reason, the show really loves to throw in the Serpent Society for when they need a throwaway action scene. These guys are constantly breaking out of jail and I’m always sad to see them. They really don’t make for interesting action scenes and they’re extremely weak. It’s hard to picture them ever holding their own against the Avengers and they feel outclassed from start to finish. Their leader gets a bit of a role during the Captain America Escape episode, but I can’t say that I’m a fan of Viper either. She’s just a little too generic for me and she is interchangeable with just about any other villain. Naturally, the show’s power levels are more than a little wonky. This is certainly a weakness that superhero shows tend to have. Anime spend more time on the power levels or at least manga based ones do. Here, you can go from having the Vision beating up on the Avengers without effort to being crushed by Thor. Iron Man’s durability also comes into question a whole lot as the scenes don’t always make a lot of sense. It’s not a huge deal, but it’s something that you’ll definitely think about as you watch the episodes. A little more speed would definitely come in handy for the Avengers and their enemies. Unfortunately, the show does end with some loose ends. The main one is definitely the Surtur plot that the show had been hyping up in the background for quite a while. It got a whole episode devoted to the future arc with Beta Ray Bill and Odin. All of it was for naught unfortunately as the series ended. It definitely had a lot of potential so it’s too bad that the series ended when it did. The show definitely deserves some props for having cliffhangers and new subplots in just about every episode. It’s one of the reasons why the show is able to separate itself from the average show. Including all of the classic plots and new characters, the show was definitely ambitious. It’s epic to think of how many things may have happened if it had reached 4-5 seasons. This really could have been a true rival for Justice League. It’s doubtful that it could have surpassed it, but more episodes would have cemented the show as the ultimate Marvel experience. Earth’s Mightiest Heroes’ soundtrack is pretty amazing. It has the greatest theme song for any superhero show and that includes Justice League. It’s by far the greatest western theme song that I’ve heard and it can even match up against anime openings. That’s some great praise for the show and the themes in the episodes also sound good. A lot of western shows seem to believe that a soundtrack is not necessary, but it certainly augments any scene. Whether for better or worse, taking the plunge and adding a lot of good tunes is definitely the right move for a show and Avengers pulled it off. 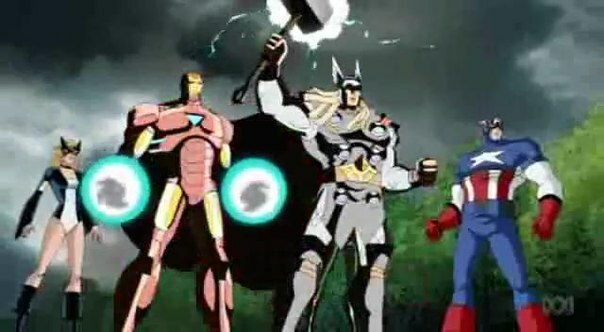 Overall, Avengers Earth’s Mightiest Heroes is a pretty incredible show. It surpassed all of my expectations and it has a lot of replay value. It’s the kind of show that you can easily find yourself re watching since the battles are so much fun. It’s really too bad that this show was cancelled in place of Assemble since it’s many times better. This show had heart, solid animation, a good soundtrack, and the writing was very well done. This is one of those shows that you can possibly consider once in a life time since I have my doubts on whether superhero shows will be able to reach the level of greatness that they once had. Well, we’ll keep our hopes high I suppose. I recommend this to all comic book fans and to anyone that wants to start a good action show. This is definitely the cartoon to watch! This entry was posted in 9 Star TV Shows, Reviews, TV Show Reviews, TV Shows and tagged Ant Man, Avengers, Earth's Mightiest Heroes, Guardians of the Galaxy, Hawkeye, Hulk, Iron Man, Marvel, Marvel Cartoon, Marvel Review, Review, Thor, Tony Stark, TV Show Review, Ultron by dreager1. Bookmark the permalink.